Whatever your moving needs may be, Meathead Movers will help you feel at home in Winchester. Our professionally trained student-athlete movers and our moving concierge will be with you for the entirety of your move to Winchester. For most of its modern existence, the little town of Winchester, California was mostly agricultural. It wasn’t until the mid-1980s when I-15 connected with SR 79 that Winchester truly began to prosper. Today, properties in this part of Riverside County tend to be more affordable than in nearby San Diego and Los Angeles counties. 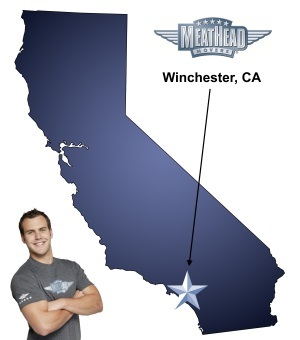 If you plan on moving to Winchester, you should consider the services of Meathead Movers. There are several things that put Meathead Movers above the rest. Our moving crews are known throughout California for being clean-cut, drug-free, and very energetic. This is no surprise, seeing how Meathead Movers hires motivated student athletes who’ve got energy to spare. You might notice other Winchester movers moving slowly and wasting time. Not our guys. Every crew member has the stamina to stay active during your move, and will even jog while not carrying items. Another thing that sets Meathead Movers apart is our unique 100% satisfaction guarantee. Meathead Movers was founded in 1997 by two teen brothers who needed a way to earn money to put themselves through school. Over the years, Meathead Movers has helped tens of thousands of households make local, long-distance, and commercial moves. In addition to providing reliable moving services, we also offer packing, storage, on-site relocations, and our distinctive moving concierge service, which connects you with local service providers. When you’re ready to experience the Meathead Difference, give us a call at 866.843.6328 and we’ll give you a free no-obligation moving quote. With our 100% satisfaction guarantee, the only thing you have to lose is the stress that comes from moving! Moving to Winchester? Here are some helpful resources. Great staff! Great people, but wish it was less expensive and I wish they would have been able to get all of our stuff. Ivan, Gustavo and Christian were all awesome. Fine young men that did a great job! Thank you! I didn't have to lift a finger or babysit them the whole time. They did everything I needed and then some.